Did you know that one of the easiest ways to start making money from your blog is to offer coaching services? 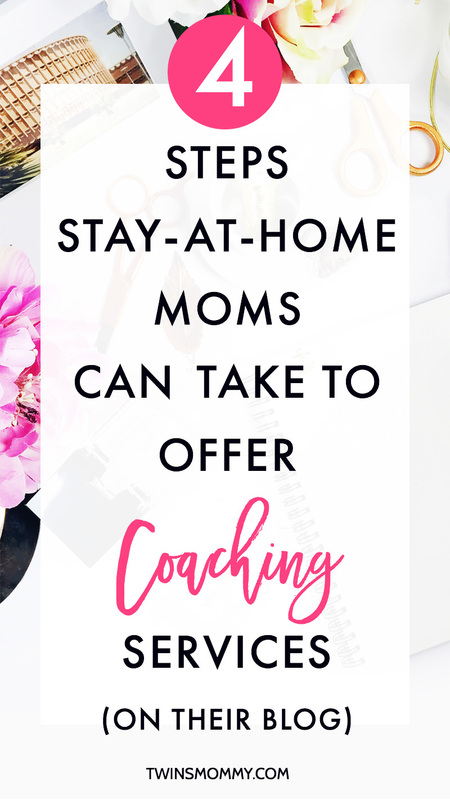 There are many services stay-at-home moms can offer, but coaching is the simplest and easiest method to generating income in the shortest period of time. But, I know what you’re thinking, what the heck can I coach? or I have no experience coaching other people. None of that matters. Any stay-at-home mom that has a blog and generates under 1,000 visitors a day – uh, that’s most of us mommy bloggers right?? – can be a coach AND generate income. And if you can show your expertise in an area, you can charge a premium for your coaching services. And what’s great is that it really doesn’t matter what niche you’re in either. Beauty blogger? Why not coach brides how to DIY a professional makeup look? Lifestyle blogger? Lifestyle coaching (self-development, performance etc…) is a HUGE industry! Fortunte 100 CEO’s hire lifestyle coaches to help them work smarter and have a more balanced life. You can coach moms on proven time saving strategies or organizational strategies. I coach new freelance writers with starting a successful business. So, you see, if you are a mommy blogger, you can offer coaching services no problem. But, how do you begin and most, importantly, how do you convey your authority in your niche? I’ll tackle that, but first we’ll go into what you do as a coach. Side note: you don’t have to call yourself a coach. You can be a mentor or a consultant if that sounds better to you! Okay, so you’ve decided coaching is something you can offer. But, what do you do as a coach? How is this different from a person talking to a friend about their issues? The biggest thing I can tell you is that a coach offers concrete advice, tips and strategies and together you form a plan of action. You can tackle one area or one problem at a time. I wouldn’t tackle client acquisition, work-life balance, and lead generation in one coaching session. I would space that over two calls. Since my coaching calls are 30 minutes, I let my clients know that the best way to make use of our time is to focus on one area they need help with. This is also a good strategy to encourage recurring coaching sessions. Set a minimum of $200 a month and let the client know how many sessions that makes up and how you many times you will touch base with them. Ideally, you’re helping people that are on the same path as you, but just not as experienced as you (like how you were a year or two ago). You can create a plan and draft it up for them, or you can create a private Faebook community where your clients can meet and help each other out. Find a system that works for you. To get you and your blog ready for offering a coaching service, follow these four steps (they’re the same ones I took). Okay, let’s get honest here? Personal and Inspirational? This means when readers come to your post and read it, they are only inspired by it and nothing more. They don’t learn anything new, they don’t take away any tips and they come away with knowing more about you, the mommy blogger. An example of an inspirational post might be, My Disneyland Trip With My Yong Children. Informational and helpful? When a reader stops by and reads your post, do they come away with some actionable advice they can use? Are your posts filled with tips and strategies? For the Disneyland post to be informational, you can phrase your post like this: How To Go to Disneyland and Keep Your Young Kids Happy and You Sane. Just reading that post tells me exactly what I’ll be learning – a low-stress trip to Disneyland (every mom’s dream!). One thing you want to start doing is auditing your blog posts and seeing how many inspirational posts your have versus how many informational posts you have. Because if you want to eventually offer a coaching service, you need to create content your “potential clients” find useful. And this means providing more informational and action-packed posts and less inspirational type posts. 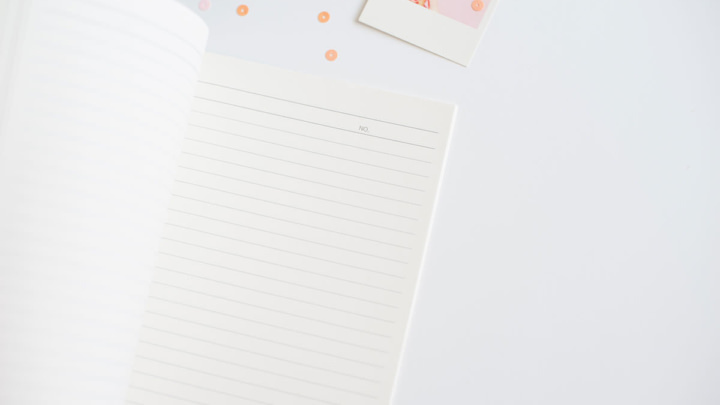 As an example, if you want to offer time saving and organizational coaching sessions, your blog should focus on content that helps moms with saving time and being more organized. Over on my freelance writing blog, most posts focus on the new freelance writer and giving them tips to help them succeed. On this blog, while I’m not sure if I’ll offer coaching, I do want to eventually create a digital product, so I’m working on providing highly useful posts for momnpreneur’s in the making and keeping my “twin life” posts to a minimum. Don’t feel you have to nix all your inspirational posts; keep them around because they help humanize you and make you more approachable! Why would someone choose YOU as a coach over someone else? And you can also reverse this and ask, why would anyone want a coach? Let’s look at the second question first. People are craving to learn new skills. That’s why the online course industry is totally booming. People are searching online for answers and they ultimately want to improve their skills in certain areas. All of these things fit nicely packaged up as a coaching service. Now, let’s turn the tables and see how you can develop a value position so that readers come to you and hire you for your coaching or mentoring. One of the biggest things you can do is create content around your potential clients and. We already tackled that in step one so let’s move on! The next thing you want to do is show your expertise in other areas. This might mean guest posting, collaborating on roundup posts, doing webinars or creating ultimate guides on your blog. 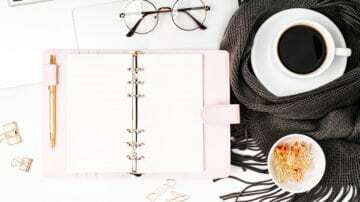 Before I offered coaching services, I showed my expertise not only with the content I shared but also with my freelance writing client list and my guest posts. And this totally made it easy to land coaching clients. When I opened shop I landed three coaching clients (two of them recurring) and my list kept growing month after month. I had to scale back on my coaching earlier this year since I had to focus on my new course for writers. All you need are a few recurring clients and you can score yourself an extra $300-500 depending on your rate. When you’ve done most of the legwork, you’re going to want to set up a page for your coaching. It doesn’t matter if it’s a separate page or part of your services page. But it’s just an area to explain what you do. Copywriter Jamie Jensen of Your Hot Copy offers consulting for small businesses. 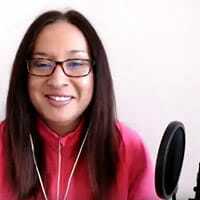 She helps with their brand message and offers strategies for scaling their business. It’s up to you whether or not you want to list your prices or keep them private. On my coaching page I list my prices and terms. It just makes it easier and I don’t have to waste time with people who are just thinking about getting extra support. In either case, just slap a coaching page up and transform your blog into a legit business! Mompreneur here I come! A great way to vet a potential client and gather some information is to ask some preliminary questions. This will save you time in the long run and you’ll easily be able to tell if your coaching can help them out or not. 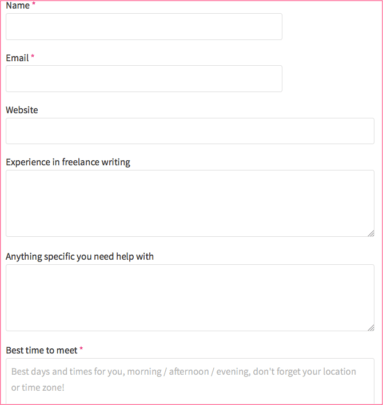 If you have a WordPress blog, you can use the Contact Form 7 plugin to create a form with a series of questions. No all sections need to have one answer. You can leave some open-ended if you want. On my form I have a spot for “anything specific you need help with.” Since I coach new freelance writers, there are a ton of different issues I could tackle. On top of managing your home and business, you’ll soon discover that Google calendar or your notepad just wont cut it anymore. It’s time to invest in a calendar booking system. One that I’m considering is Calendly. You can link to your Calendly system on your coaching page or email the link directly and have your clients book a time with you. 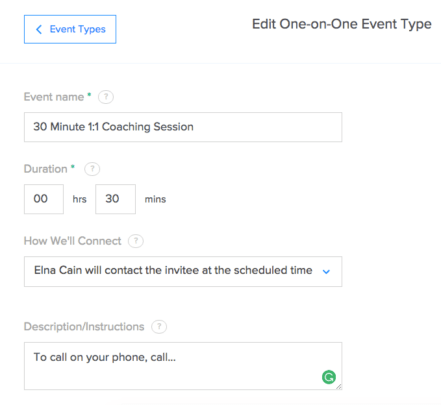 Basically Calendly lets you create an event – your coaching service. 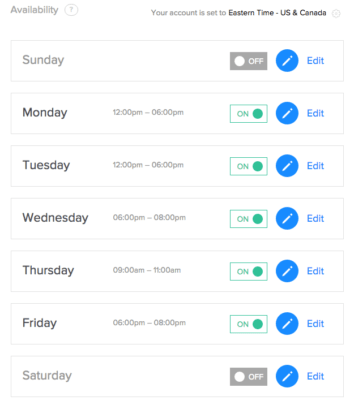 You then can choose the hours you’re available for coaching. From here they click on a day and book a time to speak with you. It’s free to use for 14 days so I’m testing this out and seeing if it’s really worth the investment. So far, I’m loving it! 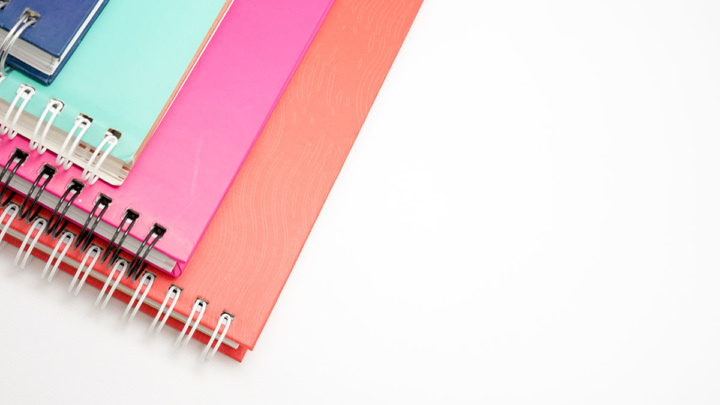 If time and management aren’t big concerns for you, opt for free tools like Google calendar. 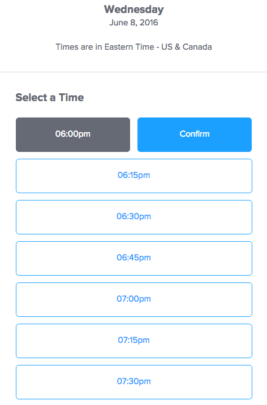 When you’re new this is probably the beset way to go, but if you find yourself getting inquiries regularly, consider using a calendar booking system that you set up and automate. Now that you have a page up and your content has shifted to more actionable advice, how do you let the masses know you are available for coaching? An easy way to drum up business is to free a coaching session. You might book up fast, but this is a classic way to turn a visitor into a client. Many will feel indebted to you after you take the time to sit down with them over a phone call, Skype or Google Hangouts, talk with them for 30 minutes and then draft up a report. They will feel obligated to sign up for your coaching package – as long as they view your free advice as HIGHLY valuable and useful to them. I personally haven’t done this, but I know it’s a popular thing with small businesses. You have an email list right? If not, start one pronto! I typically let my subscribers know that I offer coaching when I have spots open. I add a “P.S.” at the end of my newsletter and casually let them now I’m offering coaching again! This totally works when you limit the number of coaching clients you can take. An easy way to let new people know you offer coaching is to link it up in your posts. It’s not entirely effective but it’s just another way to promote your services. If you have an author bio at the end of your posts (which I think you should and is a huge pet peeve of mine. I go to your post, read the awesomeness you have and then have no clue who wrote it! Grr…then I have to hunt down your name and sometimes even your About page doesn’t tell me your name!!) link your service page there. Share it on social media by pinning your coaching service page on your Twitter and Facebook wall. It will be the first thing people see when they go to your profile. If you feel that’s too promotional, then pin a post that talks about your coaching services or links to it. 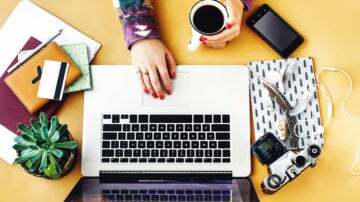 What are you waiting for mama bloggers? Offering a coaching service is an easy way to start thinking of your blog as a business is. You don’t even need experience consulting and it doesn’t take a lot to set up. Provide value-rich content on your blog that helps people’s problems. This will show readers you are knowledgeable and an expert in your niche. Set up a page and form on your blog and have some sort of calendar booking system for when the time comes. Over to you – are you thinking about offering a coaching service? Share your idea here! I honestly feel that 1:1 connection is what drives up the premium pricing for coaching. A lot of bloggers, like myself, answer emails all the time and “coach” too. So, I don’t think would be able to charge much for that type of coaching. Glad you enjoyed this post about having a coaching service! Hi Elna! I’ve been working towards this, however, how do you know what to talk about during the sessions? I mean there’s a topic but do you ask questions, let them talk and just answer questions, what if they don’t know what to say? I’ve heard about doing a type of course setup, where you lead them through a series of steps? If they come back several times I feel like I’d be lost to help. I’m building up my blog for the productivity/organization niche. ALSO! What plugin is your author bio section? Thanks for being fabulous. When I did coaching for freelance writers I always started with “so, what do you need help with the most?” I would listen to their story and offer my suggestion and tips. Sometimes I would give them work and other times resources. Then I would type up my report and send it to them. I may give them a deadline or ask them if they want to regroup in a few weeks to see how they did. Elna this sounds great. Thank you. I just came across your post on Pinterest and it gave me that little extra push to stop doubting and start doing! I’ve already got a blog and a separate life coaching website (still building the coaching site) and want to do group coaching for bariatric surgery patients. I had a gastric bypass in August 2016 and have created the course I wish I’d had when I was first dealing with post-op life. My biggest problem after getting a 12-week course all mapped out, starting a Facebook group, and setting up my webinar platform…crickets. Every support group for bariatric patients on Facebook and Spark People don’t allow you to promote your own website or services. So I’ve gotta figure out ways to get the word out and build up my list of Ideal Clients. Thanks to this post, I have a few more ideas about where to go to find them. Thanks! Thanks so much for stopping by! Your plight is very inspirational! I think creating your own Facebook group will give you the biggest ROI for your investment. You can build your tribe and promote your services and upcoming courses! I had not even thought about offering coaching. This is like the greatest idea ever. I make bath products and my blog is mostly tutorials. Many of my peoples need that extra 1 on 1 though and I haven’t seen it offered elsewhere. That’s great and so happy to hear that you will offer a service! I wouldn’t worry too much about it. Just set up a page and contact form and let your subscribers know about it! Thanks Elna, I would surely start off with it. I just found this on Pinterest and I love it. Following your blog too. I’ve wanted to do this for a while but apprehensive because I’m so new to the blogosphere. I am going to follow these steps and go for it. Thank you so much for this wonderful post. That’s awesome. And thanks for letting me know you found me via Pinterest. I LOVE Pinterest so much. I’ve read soo many awesome mommy blogs it’s awesome. So happy you’re going to do some coaching. You’ll love it. Ahhhh, I can’t decide whether to offer coaching services or not! I keep going back and forward. I think “Yep, I can DO this, I know lots of great stuff and can help a lot of people!” and the next I’m thinking “No, no, no. Everyone knows this already!”. And then there’s the whole part of actually talking to people, what if I don’t know something they ask? What if I’m a terrible coach? WHAT IF!! I know what you mean. It’s a bit of imposter syndrome and I had that A Lot as a freelance writer. You start something new and immediately start to doubt your ability. And then when someone actually wants your service and pays you? You feel like a fraud. What I can suggest is find something you want to coach and just put it out there. Create a plan in your mind. You can control the coaching by giving your client a questionnaire first to get an idea of their problems. From there you two can decide on one or two things to discuss only in your call. That way you can be prepared and have suggestions ahead of time. 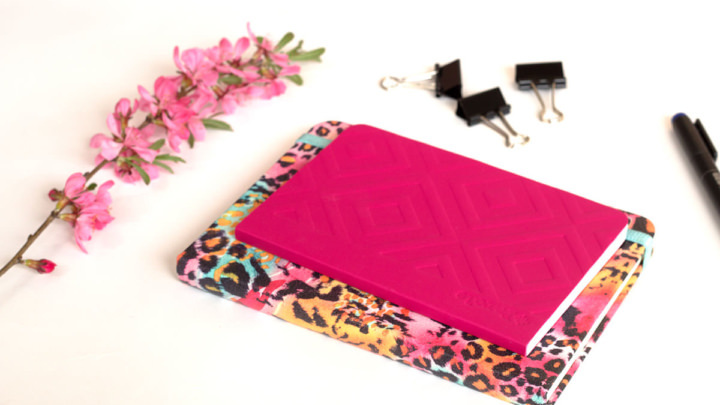 You have an amazing sense of style and your blog is full of great tips. There’s no doubt you can help other bloggers succeed! Thank you Elna. This is so helpful. I’m offering mentoring services beginning July 1 for families (Moms) who struggle with depression and ADHD/anxious children. I have years of experience living with both and a desire to help others live to the fullest while experiencing these issues. This post has really helped me as I map out my mentoring package. Oh and I never thought about a bio at the end of my posts. I’ll be updating that very soon. Thanks again!! Wow Samantha this is amazing and so niche specific. I like that! Thanks so much and how exciting that you’re starting your freelance service as a coach! Yoo hoo! I have a feeling you’ll help a lot of moms who are struggling with depression and anxious children. 🙂 Good luck! Once again OMG I LOVE YA POSTS!!!! I was getting ready to start setting up my coaching service for social media but wasn’t sure how to put it all together…Thanks for breaking it down and it just makes sense. Gaining multiple streams of income is the way to go….Thank you!! That’s awesome. So happy to hear you are on the road to being a mompreneur. Also happy to hear that this post will help you achieve that! Thanks again. Hi Elna, you always produce such valuable content which is hard to find on other blogs. 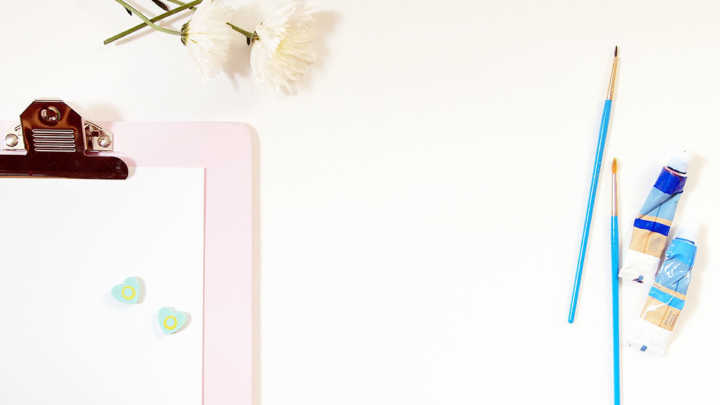 I just love your blog and the way you are branding your blog is just awesome.I love your images. I would be happy if just like coaching post you can also write a post on how to launch one’s courses. I would like to have one and would definitely be interested in reading. Thanks so much! I love how Twins Mommy is turning out in regards to the brand and community. I’ve really noticed how awesome everyone is that comments here and that are on my list. As far as how to launch a course, that’s a big one! I might do that later on but thanks for the suggestion! Totally LOVE this post!! !I will be saving it to come back to it as well..
That’s soo awesome. I love coaching other aspiring writers and helping them succeed. It’s great having that 1:1 with someone. I’m happy for you! Wow! Mind blown by all the great info here. I’m a lifestyle blogger and never thought I could offer this as a service but now I’m brainstorming what I could do with this! Great post! Thank you! I’ve thought about adding coaching to my tech ed for kids site, but just haven’t figured out the hows. (Offering to home school parents.) This article may be just what I need to get moving! That’s so great you’re considering offering coaching on your blog. I think that would be a fantastic idea. Ahh! I love this idea! I just recently thought about doing something like this but wasn’t sure where to begin. I’m not sure if I should offer coaching services to writers, since I have the education and experience as an educator, or if I should do something along the lines of motivational life coaching. Still figuring things out. But this is super helpful–thank you!! That’s awesome. You have a great background for helping others if you decide to offer coaching services. Life coaching is a HUGE industry and might be something more lucrative than writing. But, it’s up to you if you are seeking income or more of a purpose when you open shop. Part of the life coaching program/coaching can involve writing right? As an outlet or activity-based in your consulting strategy. This is great, I love the idea of being a coach! That’s great.There are so many different ways you can help people. From spiritual to inspirational to motivational! Coaching offers that 1:1 support someone needs to go through a transition. Way to go! Just pinned this like 18 times so I can come back again and again. Reading and nodding and reading and nodding. Thank you! OMW!!!! Elna I have to say this but I love you!!!!! You always write something or the other that gives me a huge confidence boost and zeal to take immediate action!! I really want to offer birthing/breastfeeding “coaching” but am a bit scared as I don’t feel expert enough!! But In the meantime while I am mustering up the courage, and “up-skilling” myself, I will definitely take your advice about creating useful content!! Thanks so much for the author bio tip too!!!! AWW! Thanks a bunch. You just made my day! So happy you are confident now to offer coaching services. I think birthing would be a awesome coaching service. Something like natural birth or just support going through the birthing process and gearing up for breastfeeding. You can hold masterclasses with other prego moms, touch base every month and just give those mamas that comfort connection! Go for it! Thank so much. Glad you stopped by. The script font I’m using is called Madina from Creative Market. I talk about it a bit in my free Create Your Perfect Pin guide that I offer in my latest growth update post. Thank you SO much, that’s super helpful and kind of you. I will check it out! Thanks again. Great! I think I’ll be doing a blogging series soon! So, be on the lookout for that. GREAT advice Elna! 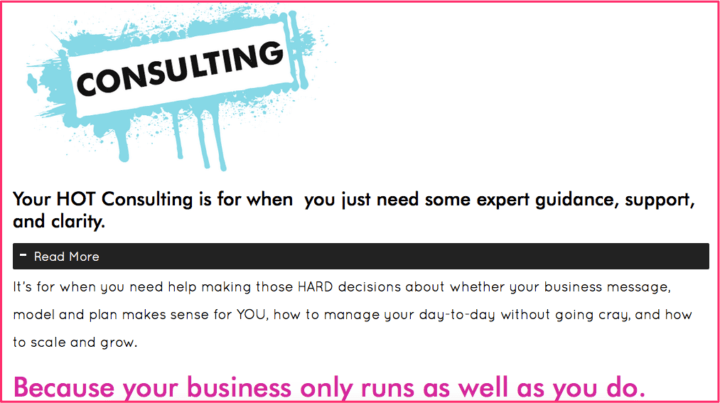 I just started offering consulting services and am still tweaking my process. Question: Are you using a plugin to create the author box? Thanks for stopping by. Love your new website and blog posts girl! You’re doing great. That’s great you are now a consultant! I’ve toned down my coaching clients since I’m totally busy with clients and my freelance course, but enjoy the 1:1 service. As for my author box, it’s part of my theme which is customized. Sorry I can’t help you out!